Nicholas Otterson was said to have run away to sea at the age of 10 to become a cabin boy, choosing the naval life for the next 35 years. Later, he would exchange the open horizons of the sea for the dark depths of the Durham coal mines, becoming patriarch to 12 children and emigrating to the United States when he was already in his 70s. His long and colorful life of almost a century provides an intriguing glimpse into the times in which he lived. LOOKING BACK over two and a half centuries of Otterson families in the northeast of England, Nicholas Otterson, born somewhere between 1783 and 1787, emerges as one of the more colorful and fascinating. A mariner for 35 years, a coal miner for another two decades and patriarch to 12 children, Nicholas emigrated to the United States at an age when most people are content to live out their final years in familiar surroundings. His life presents a portrait of a man alert to opportunity who relished adventure and hard work. His long life of between 92 and 97 years presents an intriguing insight into the times in which he lived. In the mid-1780s, Sunderland had not long emerged from being a small, rural coastal town, though it had a centuries-long history of boat building. By the time Nicholas was born, the riverside boat builders were turning out a steady stream of small ships, mostly brigs - two-masted, square rigged vessels usually less than 300 tons and used mostly for coastal trading. Still, few then living could have anticipated the forthcoming dramatic transformation of their town into one of Britain's busiest shipbuilding ports, fueled by the coal mines which covered the county, as sail gave way to steam. 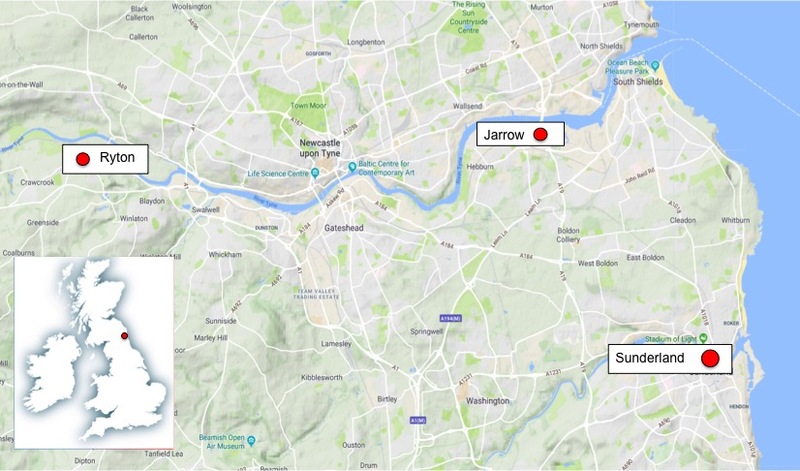 Top: Map shows the towns where Nicholas and Jane Otterson lived together with their family - Ryton, Sunderland, Jarrow, all in County Durham. 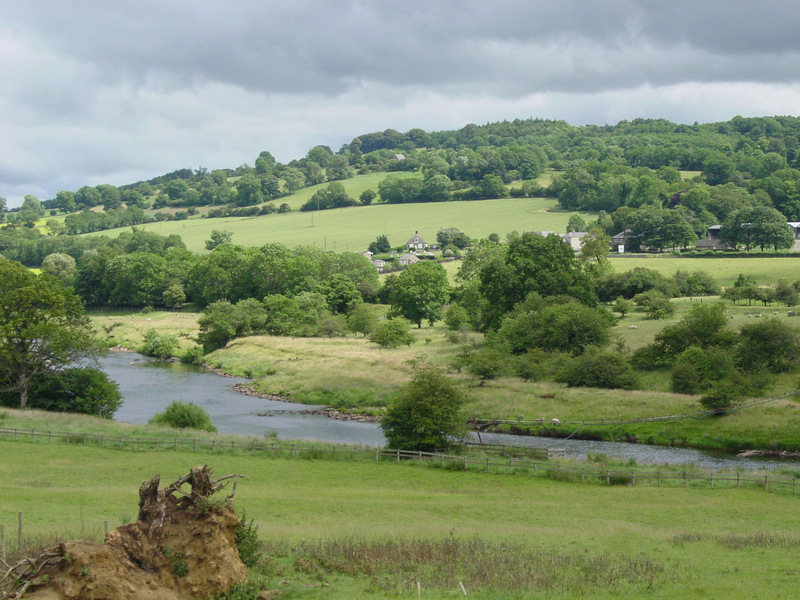 Above: The River Tyne divided the former counties of Durham and Northumberland. We know little of Nicholas's early life from official records. Two early English censuses put his birth in County Durham (the 1851 census specifically states Sunderland), between 1783 and 1785. No church birth record has yet been found - civil birth registration didn't begin in England until 1837 - so we don't know who his parents were, where they lived or what his father did for a living. In later life, Nicholas evidently told his family that he ran away to sea when he was 10 years old and became a cabin boy for the next seven years. This suggests the Royal Navy. There is nothing in the official records to contradict this, and the story is plausible for the time. Some cabin boys at the turn of the 18th century were known to have been even younger. Their duties were to run errands for the captain, but they were also expected to help in the kitchen and attend to other shipboard tasks. Before he was 18 he would have been ranked as an Ordinary Seaman. Above: Holy Cross parish church in Ryton, where Nicholas and Jane Otterson were married in 1812. Church marriage records of 1812 show that Nicholas came back to shore at least long enough to meet, court and wed 17-year-old Jane Middlemas, a native of Stamfordham in the neighboring county of Northumberland. Nicholas was around 10 years her senior. We know nothing about Jane's early years, either, or how they met, other than her birthplace was recorded as Stamfordham on the 1851 census. 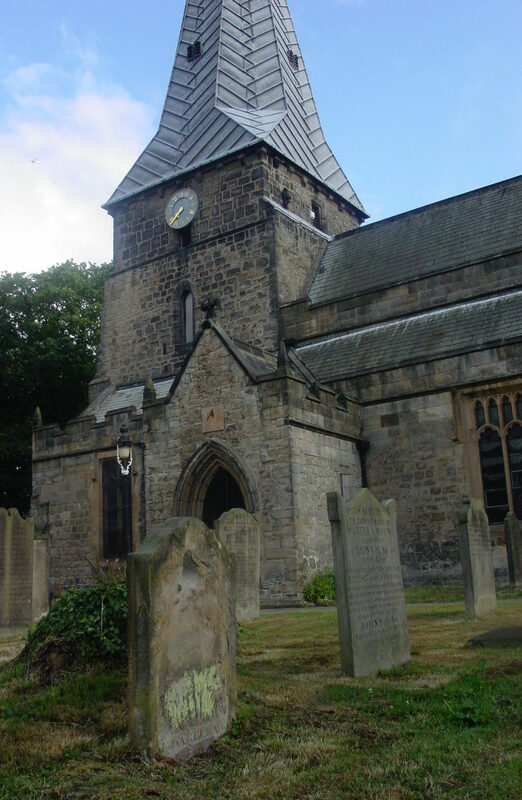 It's possible that Jane's family had moved from Stamfordham to Ryton, across the river Tyne in the county of Durham, because the couple was married there, at the Holy Cross parish church, in the autumn of 1812. 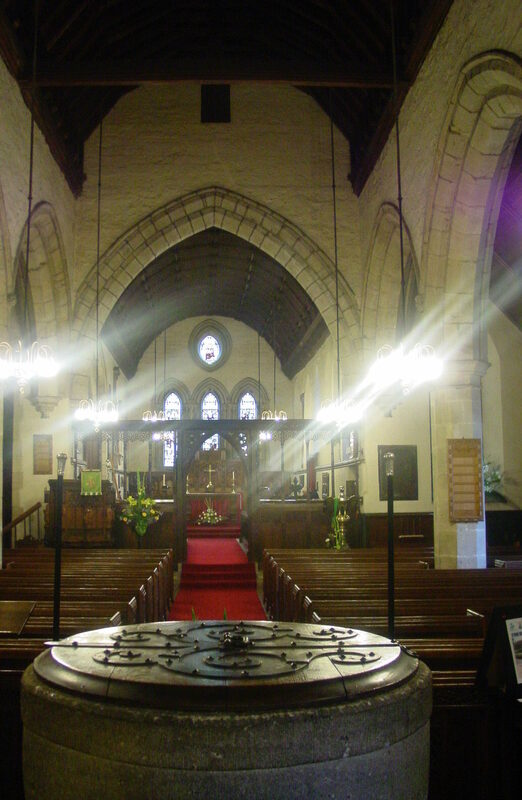 The church dates back to the 13th century and is still in use today. Their twelve children were born consistently every couple of years between 1813 and 1837. By 1840, however, four of their sons had died as children or infants. The Holy Trinity Church in Sunderland where the first four children were christened lists Nicholas’s occupation in each case as “mariner.” Following her research in 2005, Vivien Byers Hardy suggested that Nicholas would have been in the merchant service, possibly on coastal vessels, rather than in the Royal Navy where the voyages were usually much longer. With his 12 children coming so rapidly and regularly, it seems less likely that he would have been away for long stretches. Balanced against this is Nicholas's assertion many years later that he served for seven years on a "man o' war." In any event, the family moved home several times in these early years, starting at Long Bank in Sunderland (possibly the same address as High Street), then the “East End” of Sunderland, and then Stafford Street in 1819. Whether serving in the Royal Navy or the merchant service, Nicholas was back on land some time in the 1820s, and for the next two decades opted for the Durham coal mines, where his sons also labored. A remarkable document has been found which gives a glimpse into this family’s working conditions in the early 1840s, and it mentions Nicholas in passing, though not by name. It was uncovered by Margaret Otterson Seabourne in 2005, and is an extract from the Royal Commission into the Employment of Children in Mines. In it, 12-year-old John Otterson, Nicholas’s seventh child, describes his life as a child miner in that terrible period. He includes a reference to his father, who gave him four candles a day when working in the mines. The extract makes sober reading. Nicholas and Jane’s last child, Jacob, died early in 1840 at the age of 3 of a bowel inflammation. By this time, it seems Nicholas and his wife had returned to Sunderland, and Nicholas was working as a miner at Monkwearmouth Colliery. Interestingly, on his infant’s death certificate he again describes himself as a "mariner" - possibly an indication of how he regarded himself after 35 years at sea. But the evidence points to him working in the mines at this time. In 1857, the wife who had been his companion for 45 years died at Monkwearmouth Colliery of chronic asthma. Nicholas and Jane had been married for 45 years. By now Nicholas was 70 years old. He and his wife had produced a large posterity - 12 children and 41 grandchildren to date - although some had died in infancy as was common for the time. Nevertheless, Nicholas was about to make a surprising decision. His daughter, Elizabeth, had emigrated to the United States with her husband, Thomas Parker, a dozen years earlier. It's highly likely that Nicholas would not have seen her since that time. Soon after Elizabeth left, son Joseph followed her to America. Both the men in the families went out as miners to work in the expanding coal industry in Indiana and Kentucky, but Elizabeth's husband had died. She had by now remarried to another former English coal miner, George Blake - a decision that would have a profound effect on their lives when George and Elizabeth decided to move north to the territory of Wisconsin and take up farming. The move worked well for them. Perhaps Elizabeth, now in comfortable circumstances, wrote to her father inviting him to come and join her after learning of the death of her mother. Or, it could have been the restlessness of a former mariner - we will probably never know. Either way, Nicholas left England some time within two or three years after his wife died. 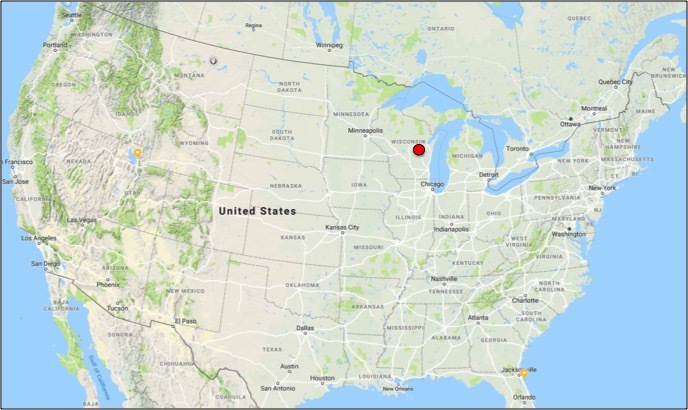 He appears on the 1860 federal census of the United States living with George and Elizabeth and his two grandchildren in Winneconne, a community of mostly farms along the Wolf River, in Winnebago County, Wisconsin. If he ever planned to return to his native England, there is no evidence of it. Ten years later, the 1870 federal census shows the old retired Englishman in his late 80s living comfortably. By this time, daughter Elizabeth and her husband George are in their mid-fifties and the home is valued at $7,000 - not a small sum in those days. The personal estate is worth another $1,159, making George Blake one of the most prosperous farmers in the village. Nicholas is the only other person living in the home. The more detailed story of Elizabeth Otterson and husbands Thomas Parker and George Blake is told here, along with more details of their posterity. As for Nicholas, it seems that even at his advancing age life was far from over for him. Two newspaper articles from the town of Omro, near the Blake farm, offer some valuable additional insights. The articles appear below, but the challenge is how much to accept and how much was misreported or simply fanciful. By all accounts, Nicholas was in fine health - never having lost a tooth, able to see perfectly and never having seen a doctor, according to the newspaper. That can only have come from Nicholas himself, as are the tales of dancing the "Fisher's Hornpipe" - more likely the "Sailors' Hornpipe" - on a table set with drinking glasses in order to amuse the grandchildren. But evidently he had taken to farming, and was described as "a man of brawn and muscle," as well as "lithe" and "agile," so he wasn't the type to sit around while others worked. There are some clear discrepancies in the newspaper reports. Clearly he did not have 19 children, and once his name is given as "Otterman." Twice he is referred to as being born in Denmark. In fact, on the 1860 census in the Blake household the census taker also recorded his birth as in Denmark, although the same census taker wrote his name as Nicholas "Allison" rather than Otterson. This census has to be set against the two earlier English censuses that record him as being clearly English. Did the old sailor run away to sea from parents in Denmark rather than England, join the British navy as a ten-year-old and so regarded himself as English? That seems unlikely, especially as we know other Otterson families were living in county Durham in the early 1700s, from whom Nicholas may have been descended. Who wrote the newspaper articles? 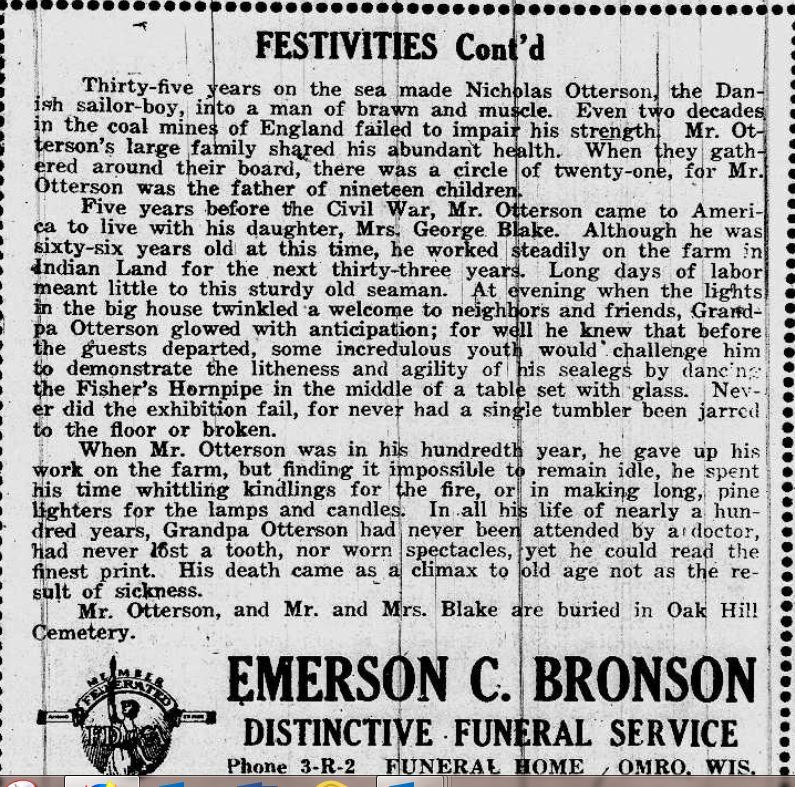 They appeared over two successive weeks in the Omro newspaper, and immediately below the stories are two advertisements from the Bronson funeral service, which make the reports themselves look like paid inserts. 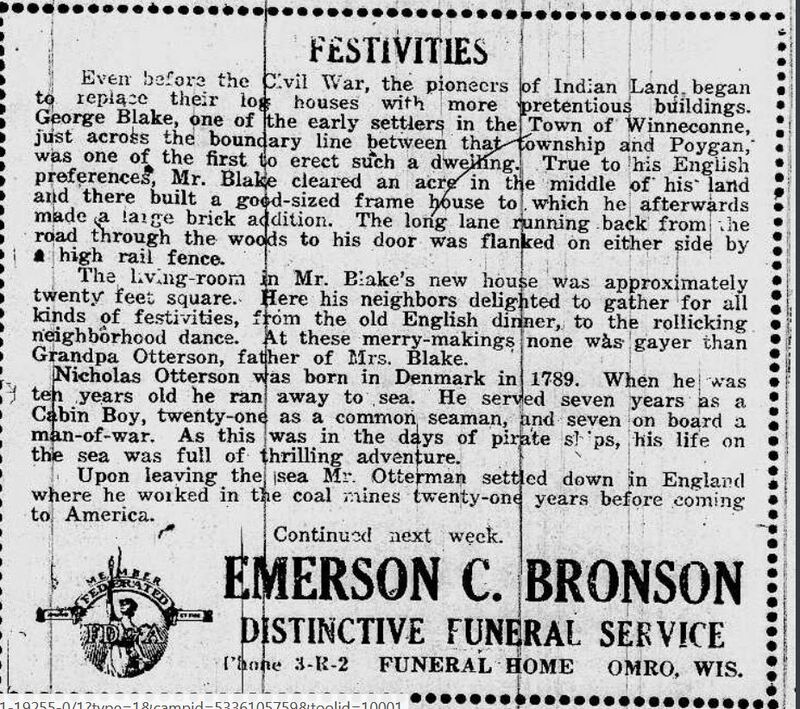 The funeral home of Emerson C. Bronson is significant, because Elizabeth Otterson Blake's granddaughter, Maria Hannah Parker, married a Bronson, and the Parker and Bronson graves lie next to each other at Omro cemetery. If the funeral director attended the gatherings at the Blake farm, which is described in detail, it adds to the credibility of at least some of the reports. Further research may eventually throw more light on this interesting question. 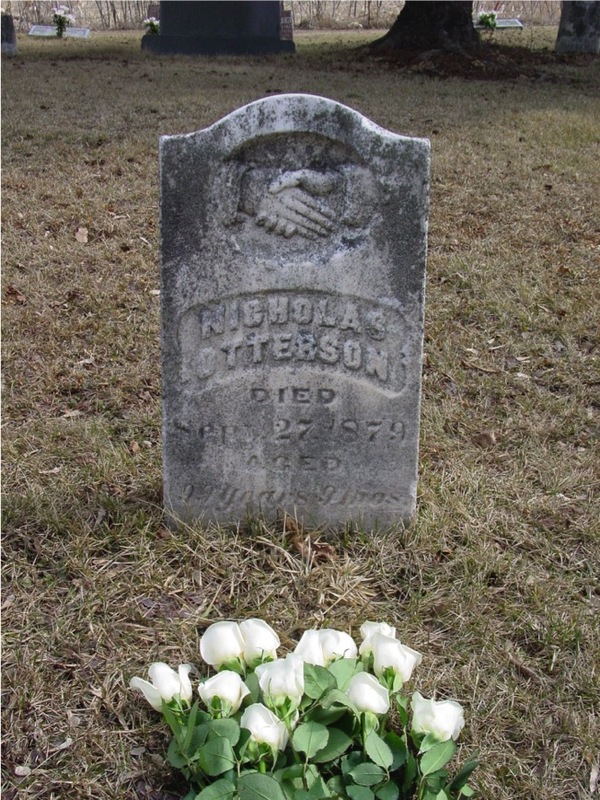 As for Nicholas Otterson, his grave was located early in 2009 by Michael Otterson, his third great grandson, and his wife, Cathy. 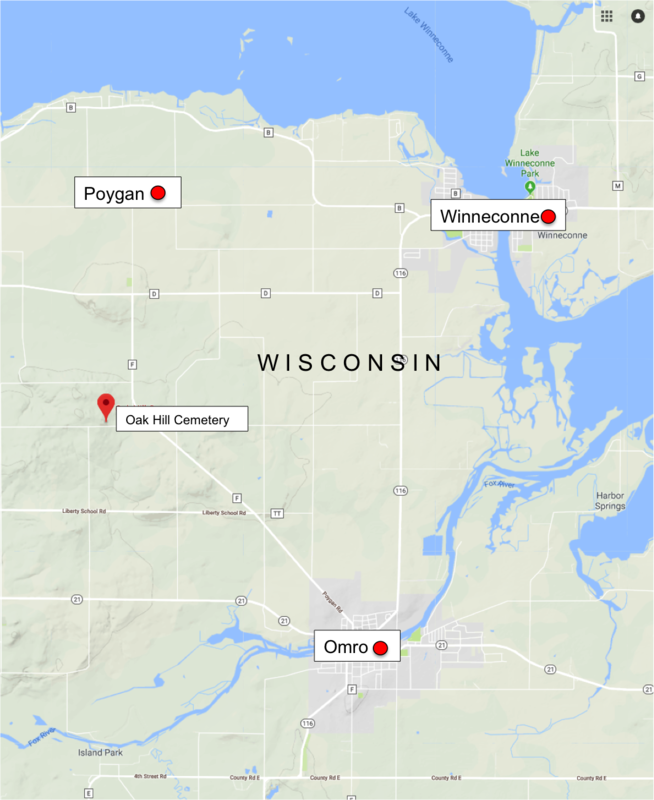 He is buried in Oak Hill Cemetery in the rural community of Poygan, Wisconsin, just a couple of miles west of Winneconne where he spent his last 20 years. According to the gravestone, Nicholas died on 27 September 1879, age 99. His age is overstated by at least a couple of years. In March of 2009, flowers were laid on Nicholas’s grave by his descendant - probably for the first time in well over a century - in acknowledgement of his remarkable and eventful life.